1. IEEE 802.11b/g compliant with 54Mbps high-speed data rate. 3. Virtual DMZ, port forwarding. 8. 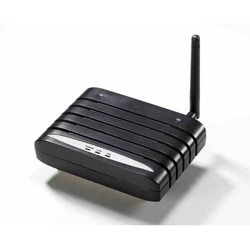 Wireless security – 64/128bit WEP, WPA/WPA2, 802.1x & 802.11i. 10. Universal Plug and Play, no complicated installation necessary. 11. Quick and easy setup with web-based management utility. 12. Replaceable antenna allows user to replace higher gain antenna. 1. Standard: IEEE 802.11g/IEEE 802.11b. 2. Frequency band: 2.400~2.4835GHz. 3. Radio type: (1) IEEE 802.11g: OFDM (64-QAM, 16-QAM, QPSK, BPSK). (2) IEEE 802.11b: DSSS (CCK/DQPSK/DBPSK). 4. Data rate: (1) IEEE 802.11g: 54, 48, 36, 24, 18, 12, 9 & 6Mbps; auto-fallback. (2) IEEE 802.11b: 11, 5.5, 2 & 1Mbps; auto-fallback. 5. Access protocol: CSMA/CA. 6. Number of operation channel: U.S. 1-11; Japan 1-13, 14; Elsewhere worldwide 1-13. 7. Working mode: ad-hoc or infrastructure. 8. Security: 64/128bit WEP, WPA, WPA2, 802.1x & 802.11i 9. RF output power (typical): (1) 802.11b: up to 20±1dBm (2) 802.11g: up to 16±1dBm 10. Sensitivity: -68dBm @54Mbps' -80dBm @ 11Mbps. 11. Antenna: one replaceable antenna(male SMA reverse).